It was after lunch but well before dinner, a slow time for customers. Mandrapa was in a room to the side where no customers currently were. His face was trimmed, but not clean-shaven, the stubble showing signs of gray. A trucker hat that read, “Come Hell or High Water” and “Torpedo Crew,” was on his head, and he had a navy fleece pullover embroidered with “Check’s Billiard Parlor.” There was a cast on his left arm. Since Mandrapa came to Bowling Green from Bosnia and Herzegovina as a 17-year-old in 1996, he hasn’t settled down. Rather, he’s expanded his presence in town through his culinary artistry. 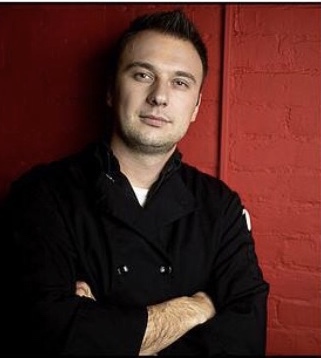 Today, he is the executive chef and part owner of three restaurants in town: Novo Dolce Gastro Pub, Pub By Novo and The Bistro. The Bosnian War took place from 1992 to 1995 over the move for independence and breakup of Yugoslavia, resulting in 100,000 deaths of mostly Bosnian Muslims, known as Bosniaks. One of the lowest points of the war was the Srebrenica Massacre in the summer of 1995. Serbs attacked the Bosnian city of Srebrenica, which had been declared a safe haven for refugees by the United Nations. The slaughter of Bosniak men and boys ranged from 7,000-8,000. It was the worst genocide in Europe since the Holocaust. The three-year conflict left around 2 million people, nearly half the population, displaced. Mandrapa, like many others, came to the U.S. as a refugee. From 2011-2015, the U.S. Census estimated 13.9 percent of the Bowling Green population to be foreign-born. In comparison, Kentucky’s foreign-born population was estimated to be 3.4 percent. The International Center of Kentucky, which provides a support structure to refugees, is headquartered in Bowling Green and has an office in Owensboro. Bowling Green has a large community of Bosnian refugees, Mandrapa included. It was the freedom that made it fun. However, he saw stuff that some kids should never have to see in life. Being around the guns and bombs was sad he said, but he had fun. Teenage Mandrapa came to the U.S. alone. His sister, brother and parents remained in Bosnia and Herzegovina with his grandparents, though his sister would eventually move to St. Louis after coming to the U.S. to visit him. To his parents, it was important to at least get one of their children to the U.S., Mandrapa explained. It is one of their biggest regrets now, he said, that they didn’t come with him. Mandrapa’s uncle had come to the U.S. in 1994. When Mandrapa followed two years later, he served as his guardian. Everyone wanted to come to the U.S., Mandrapa said. Mandrapa attended Bowling Green High School then Western Kentucky University where he studied electrical engineering for three years. While enrolled, he worked as a dishwasher at The Brickyard Café on Chestnut Street, which was owned by a Bosnian restaurateur who was a friend of Mandrapa’s uncle. Mandrapa worked various jobs there, from making salads to pizzas, and loved every bit of it. The price of enrollment and books kept him from registering for a fourth year. Instead of attending the last year of college, Mandrapa moved to St. Louis where his girlfriend, who he met in high school and would eventually become his wife, was attending chiropractic school. He moved back to Bowling Green in 2007. Today, Mandrapa and his wife, Sanda, now a chiropractor, have two kids: 4-year-old Mona and 21-month-old Aleks. “We are lucky we live in a community like this. Small, safe,” he said. Every year and a half, their family goes to Bosnia and Herzegovina to visit Mandrapa’s family that remains there. They are planning to go next year. His parents and brother, who’s two years younger than him, still reside there. Mandrapa said family and close friends are important to him and his wife. Every chance they have to grill out or have people over, they do. The days he gets off are like a holiday because on actual holidays, when everyone else is off, he works. The Bistro’s location changed to College Street in 2008. Tucked to the side on College Street, a couple blocks down from Fountain Square Park, The Bistro provides gourmet dining from dinners for two to private work parties. 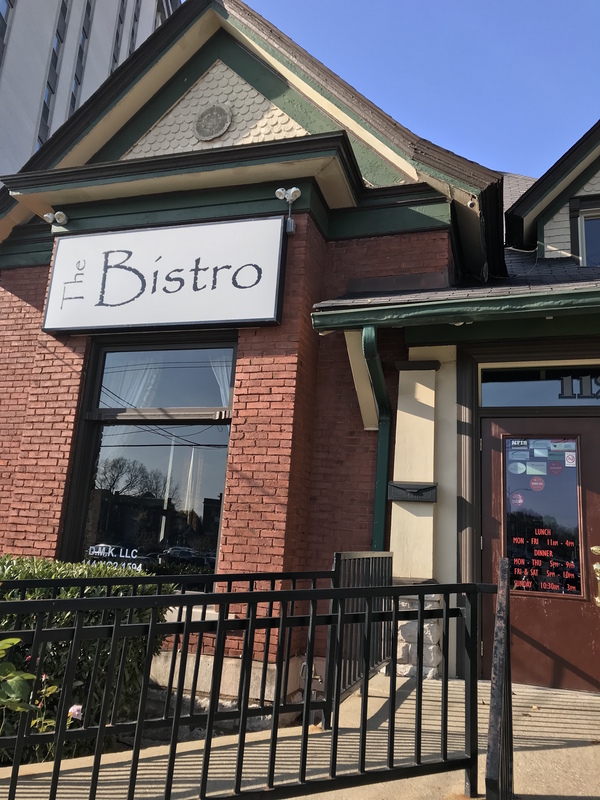 When Mandrapa moved back to Bowling Green from St. Louis, he and two friends opened The Bistro originally on Russellville Road in January 2007. They bought the building on College Street in October 2008 and opened the doors there a month later. “It was great, working all day, drinking after that…drinking all day,” he said, taking a sip of his drink. He had never worked more in his life for less money he said, but it was the best decision he ever made. The menu features American and Italian fare. Novo Dolce Gastro Pub was opened in May 2012 as a sandwich and expresso shop on Old Morgantown Road. In 2014, it moved to a larger location behind Penn Station off 31-W. The new location had a full-service kitchen, bar and expanded menu. The bar has a marble countertop and brick wall behind the shelf of alcohol. The walls of the entire restaurant are gray, the darker tables and floors adding a level of sophistication. The small lights above are industrial, reflecting off the surfaces. Novo Dolce means “new sweet” in Italian, and a Gastro Pub is a term originally coined in London during the 1990s. A combination of gastronomy and pub, a Gastro Pub provides a higher quality of cuisine in a comfortable, familiar environment, according to Novo Dolce’s website. It also says a Gastro Pub is “food-forward” and has a focus on creating dishes that are both interesting and comfortable. Some of the dishes served include the Fra Diavolo pasta, made with penne noodles, bacon, garlic, and spicy tomato cream sauce and the Fish and Chips, made with beer battered cod and served with fries, tartar sauce and apple slaw. Pub By Novo opened in 2016 on Scottsville Road and is Mandrapa’s version of a sports bar. Mandrapa and his business partners opened The Pub By Novo in 2016 off busy Scottsville Road in a strip of local businesses. Leather booths, metal tables, neutral tones and sleek, straight lines greet customers. TVs hang throughout the restaurant and there’s a mural of pop culture icons like Betty Boop and the Joker from Batman on a main wall near the bar. There are a total of six hand-painted murals in the restaurant. “It’s my version of a sports bar,” Mandrapa said. Joey Zinni is a 32-year-old from Mt. Carmel, Illinois who has been working at The Pub By Novo since it opened nearly a year ago. It was just the weekend before when Zinni and Mandrapa sat at the bar together and had a few drinks. Though he doesn’t work with Mandrapa on a daily basis, he still considers him a boss. 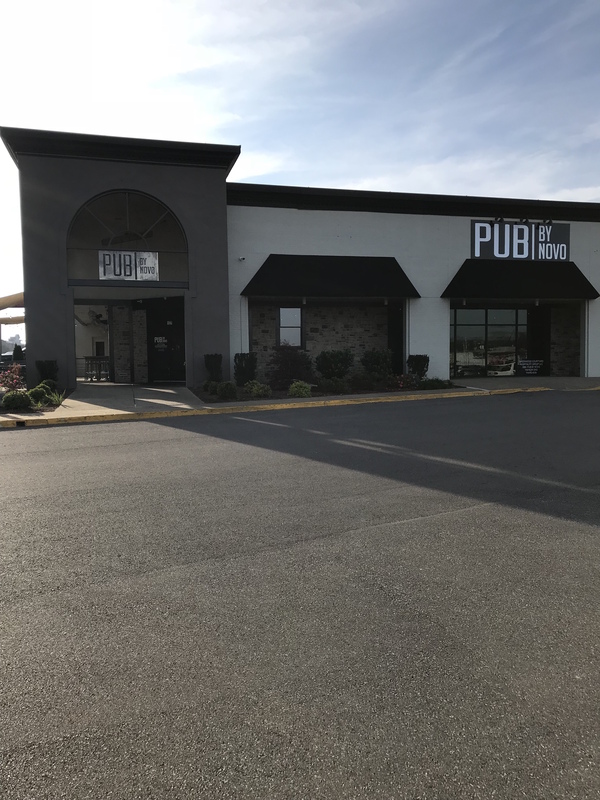 After 27 years working at the admissions office at Western Kentucky University, Greg Purpus, 58, was eating at The Pub and he liked the experience so he asked if they were looking for any help. A hostess had just left so they had an opening. A week after he retired from WKU, he started working part-time at The Pub. It’s been six months, since he started there, Purpus explained rather reluctantly from behind the host stand. He works as a daytime host Monday through Friday and likes getting to still be around students in a good atmosphere with other good people, he said. The creation of the menu is a carefully considered process that changes with the seasons and uses ingredients straight from local farmers in Bowling Green. Mandrapa explained his thought process about the menu as he leaned back in the leather booth at The Bistro, his hand mildly gesturing, showing cleanly trimmed nails. “Simplicity is key. Less is more. Don’t complicate it. If the ingredient is right, don’t overdo it,” Mandrapa said. Lauren Pickren, 22, is a senior at WKU studying healthcare administration. She’s been to all three restaurants but says The Bistro is her favorite pre-football game ritual with her roommate Sarah. “My roommate and I always go there for brunch before the Saturday games. The brunch menu is amazing,” she said. He doesn’t think he can just get a job and be done with it. He repeats, he doesn’t think he can do that. Later down the road, he’ll slow down but not stop working. He likes Bowling Green and can see himself staying there, but for five to six months of the year, he wants to be somewhere else.